The government has said publicly it wants to use State asset sell-off revenue for job creation but confidential documents paint a different picture. The government has indicated it will sell its stake in Aer Lingus but where will the proceeds go? THE GOVERNMENT’S PUBLICLY stated aim of using money created by the sale of State assets for job creation is undermined by its commitment in confidential draft Budget documents to allocate any additional unplanned revenue to reducing its debt. In confidential draft documents obtained by TheJournal.ie the government says that in order to meet the targets laid out by the EU and IMF in the bailout programme “any additional unplanned revenues must be allocated to debt reduction”. The confidential draft documents prepared by the government and circulated to all 27 EU finance ministers as part of Ireland’s bailout programme disclose that an “ambitious programme” for State asset disposal, the exact details of which are not disclosed. However, the documents do outline that it will be based on the Programme for Government and the McCarthy Review of State Assets and will be discussed with the Troika – the European Commission, the European Central Bank, and the International Monetary Fund – by the end of December of this year in advance of final decisions being agreed. The government has publicly stated it wishes to use money from the State asset sell-off for job initiatives but the wording of the draft documents contradicts this in that it maintains, in line with the bailout agreement, that any unplanned revenue “must be” used to service Ireland’s debt. A Department of Finance spokesperson told TheJournal.ie today that the documents are a “draft” and that “no decisions have been taken”. They also said the government’s view that revenue should be used for job creation and growth was “one of the key issues that remains to be agreed”. “These issues will be discussed further at the next quarterly review between the Government and the external partners,” the spokesperson added. The State’s share in the Aer Lingus, ESB, Eirgrid, Coillte, Bord Gais and Bord na Mona are all being considered in light of the need to raise revenue but the confidential document insists that there will be an “orderly process” that will avoid “fire sales”. Already the sale of a minority stake in the ESB has been confirmed by the government. 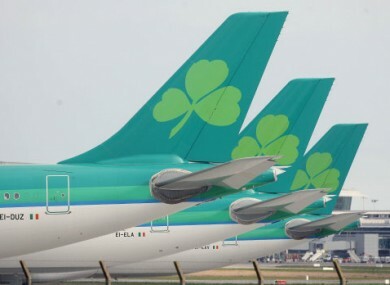 There has also been a suggestion by Transport Minister Leo Varadkar that a sell-off of the governments stake in Aer Lingus is likely. “The timetable for implementation will take into account the need for an orderly process that avoids fire sales and allows time to implement regulatory reforms,” the confidential draft documents state. The Programme for Government outlines a commitment to raise €2 billion through the sale of State assets which will only be sold “when market conditions are right” and the appropriate regulations have been established to protect consumers. The McCarthy report warned against the sale of all State assets and advised the any gas and electricity assets should not be sold private interests “in the immediate future”. The Troika have called for Ireland to commit to raising €5 billion through the sale of State assets but the government has indicated publicly that it is only committed to going beyond €2 billion if it can get an assurance the revenue will be used for reinvestment and not debt reduction. The draft documents contradict this in that it maintains “any additional unplanned revenues must be allocated to debt reduction”. In September the government set up a Strategic Investment Fund, NewERA, which is to oversee the management and potential sale of stakes in State Assets. NewERA is headed by Eileen Fitzpatrick from the National Treasury Management Agency, who was previously a senior management figure at AIB. In its fourth review of the bailout programme, the European Commission warned “authorities against initiatives that may maximize the short-term revenue raising potential of the State assets but undermine the economy’s medium-term competitiveness and growth potential”. Email “Budget leaks: State asset sell-off may not yield money for job creation ”. Feedback on “Budget leaks: State asset sell-off may not yield money for job creation ”.